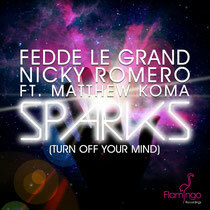 After the huge success of the Instrumental edit of 'Sparks (Turn Off Your Mind)', which reached the #2 spot on the Beatport Top 100, Fedde Le Grand and Nicky Romero are now ready to unleash the full vocal version on August 27th. Featuring singer Matthew Koma on lead vocals, ‘Sparks (Turn Off Your Mind)’ underlines the continuing influence of both artists across the exploding world of EDM. Shuddering with thundering rhythmic bass sections and soaring crescendos of orchestral synths, the single is Le Grand and Romero at their best and has become one of their biggest tracks on festival, club and Ibiza sound systems over the summer months. It’s out on Flamingo Recordings exclusively on Beatport. Check it out below.